We humans produce an amazing amount of garbage every day. This poses problems of efficient removal of said trash. Different cities handle it in different ways. 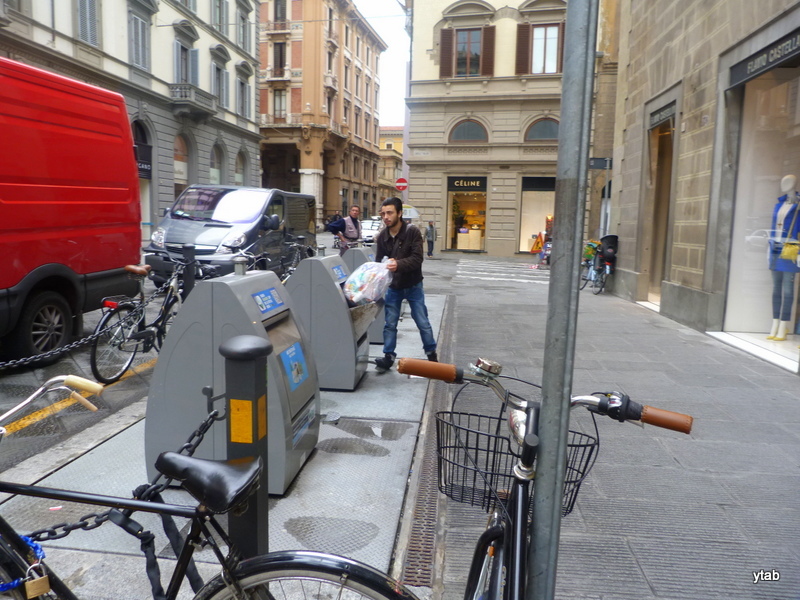 In Florence, householders generally have to carry their rubbish (and recycling stuff) to big, smelly bins like these. Trucks carry away the detritus, on a regular basis. 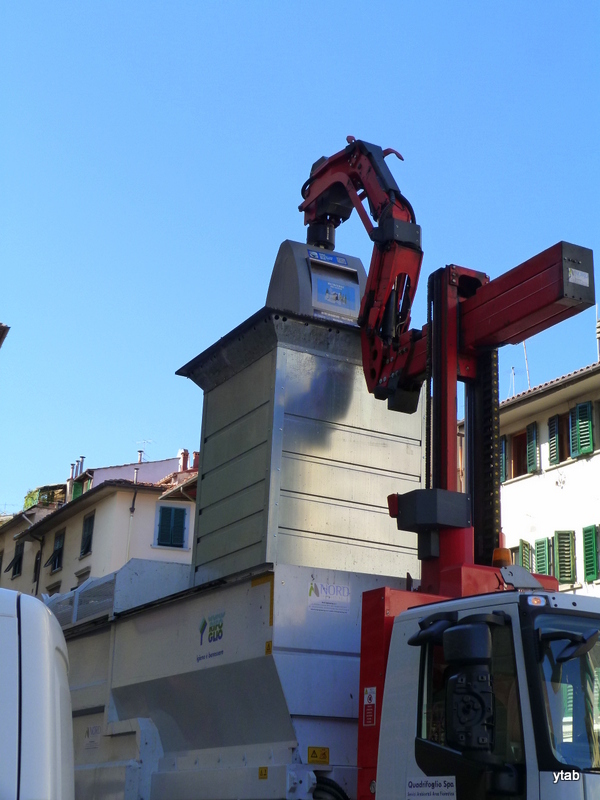 The tax paying residents in the historic centre got fed up with the noise and smell of this process, and the result has been that, progressively, the bins to collect rubbish and recyclables are being buried under the pavement. Here’s what they look like from the street-side. This is where you would put your organic wastes which will drop down into the underground holding bin. Here’s a line up of receptacles for every type of rubbish/recyclable. Someone doing the right thing. And, here is how the bins get emptied. How does your town/city/council deal with garbage? Now, isn’t that the truth, Sheldon! Isn’t it a brilliant idea. What problems we create with our rubbish, eh? Brilliant, somebody in the town hall can think, and get others to take up a good solution. The system in our area works very well, we have (big) different coloured bins, for each house and we put out one or other colour every week. Almost everything is recycled. It’s so good when councils get recycling going in communities. Some of our towns are just too far from recycling centres to make it feasible. Our council can’t accept cardboard, for example, as there is no place near enough that deals with it. 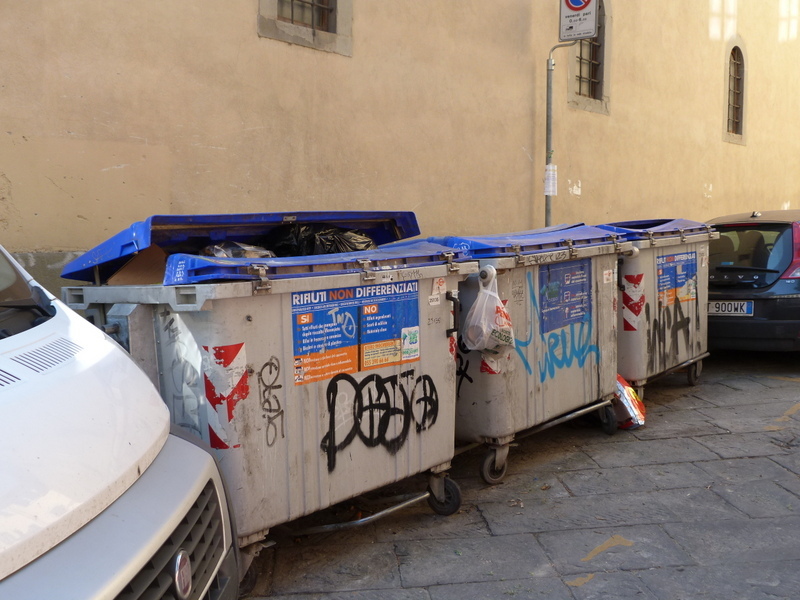 Inconceivable–fascinating descriptions of trash pickup from everywhere! We need someone from a developing country to really educate us on how it’s done in their world, Greg. 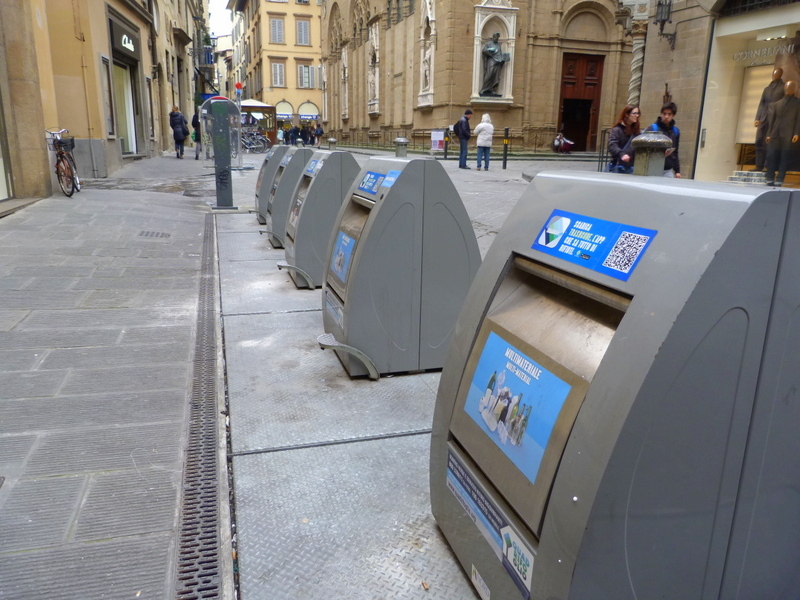 What a good solution to the big smelly bins they’ve come up with in Florence! As well as cutting down on the general unpleasantness, it would deter the (human) scavengers who always leave the bin lids propped open, thus vastly increasing the unpleasantness and attracting non-human scavengers. I wonder if it would work here? Of course, the whole units would have to be waterproof! And the above-ground parts might need to be a foot or so taller to rise above acqua alta. I thought about Venice when I saw these, and came to the conclusion it might not be possible. By the images shown on Facebook, Venice has been having a crop of mighty strange tourists displaying a very high degree of ignorance and bad taste. My Italian teacher Josefina sent me the link to the Italian newspaper article which included some pictures of some pretty disgusting tourists and their leavings. From now on when people ask how they should dress in Venice I’ll just say “pretend you are having lunch with your grandmother”…although there is a new generation of “younger” grandmothers where that might not work. Too bad there aren’t enough police to enforce the laws (and fines) that are supposedly already on the books. Yes, I am totally disgusted with the way some people treat my beloved. PS I convinced Max not to wear shorts on his trip. He’s sweating in Firenze as I write this. On Sunday he will be sweating at the Palio and on Monday he’ll be sweating his way down the Grand Canal. Well, most of it is no different from the bad behaviour which is reported every summer. A new low, though, is the 2 young men in swimming trunks sharing a bottle of wine while lolling on the Partigiana. That was the one that bothered me the most Caroline. Yes, that was so sad to see. Well, at least they were wearing bathers, unlike the fellow near the Pescheria. And, thank you for your follow, Sheldon. Thanks…I always wondered how so much could go into such a little space. Completely missed the bigger box !!! I’ll bet your attention was deflected by a family crest on a wall near the bib tops! Especially so close to Orsanmichele! Hah! 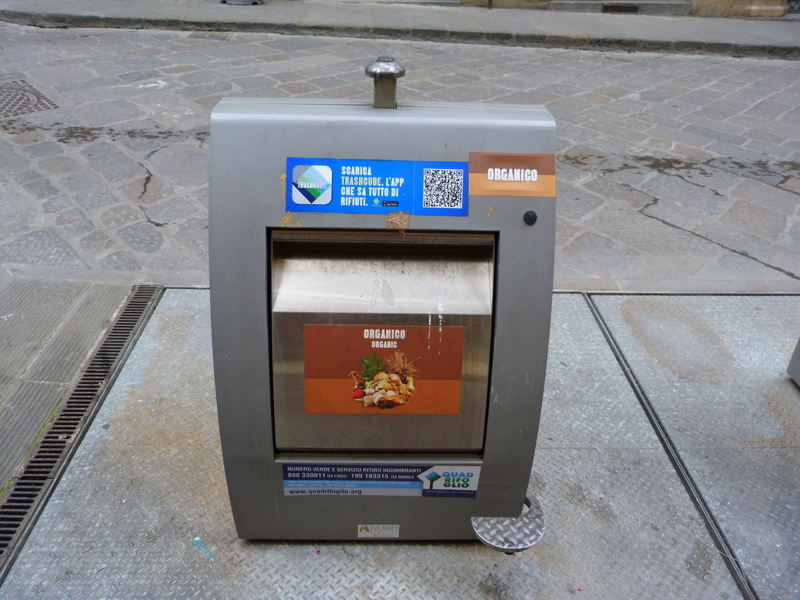 Clever system in Florence! Here in our town in south-western Germany each house has a green bin for recycling garbage, a black one for rest garbage and some have a brown one for organic garbage. Each bin gets emptied every two weeks. That’s very like the system in my town, except we don’t recycle organic waste, unless we have our own compost pile. We do it either way, depending on the space we have for an additional bin. What a difference ! 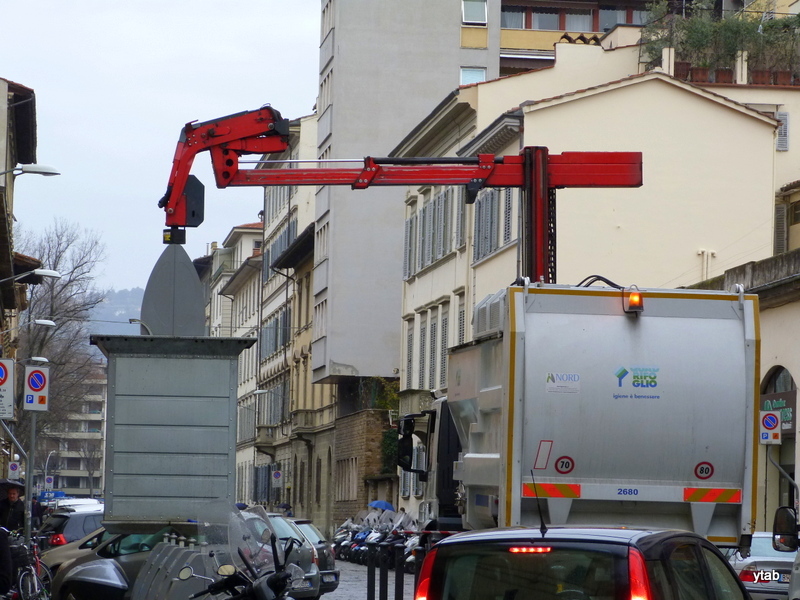 Florence , this town of art , deserved a system of elimination of the garbage linking elegance and efficience . Thanks, Yvonne for your kind intention. I appreciaye much. What was wrong with just chucking it on the side of the road or, better still, throwing it over the fence into the neighbour’s? You clearly didn’t like the neighbours on the other side. You just go on in your little dream world, Bruce. The best refuse collection I saw was garbage boats in Venice! They do have the system well organised there, Andrew. I really admire the men and women who sweep the streets and collect the rubbish in Venice, they work so hard and always seem cheerful. Our recycle bin is picked up every fortnight, ordinary rubbish every week. Marmalade? Mayonnaise? What are those things, Derrick? These are relatively new. I have been watching them being put in place over the last few years. It seems like a much cleaner option than before. I was really impressed with this initiative, Debra. The garbage in Holland too is held below the ground. It has the best recycling method in the world and almost all is recycled. Public rubbish-tips were closed down years ago. Shops must take back all used white goods and all used electrical stuff. No kerb or street collections either. All shop trolleys are deposit only and no plastic bags. Venice, unlike Florence, doesn’t recycle organic waste, but otherwise, people seem very good about sorting things. However, I’m not entirely sure where the non-recyclable stuff goes from the lagoon city. That’s something for me to find out, next time. The apartment I had in Venice had a schedule taped inside the kitchen cabinet saying what was collected when. Cardboard on certain days, cans on another, glass on another. Garbage could go every day….well, there was no collection on Sunday. You put your bags out everyday by 8 am….but don’t you dare put them out the night before…and men with very noisy carts clomped over the bridges and picked it up and took it to a barge where they compacted it (another very noisy early morning process) and then I’m pretty sure it was shipped off to Mestre. Oh, and if it wasn’t out by 8 am it didn’t get collected and the seagulls made a mess of it all over the calle. So if you ever were walking in Venice and wondered what those plastic bags were hanging from doorknobs or hooks by the door….now you know. Of course, Yvonne already knows all of this. Here we have two big smelly bins in the back parking lot of our building….one is for recycling, glass, aluminum, paper, cat food cans (I contribute greatly to those) etc. The other bin is for everything else and people tend to put just about everything from mattresses to lumber in those. A couple times a week big, noisy trucks come haul it away. This is where I live now but when I lived in Seattle we had bins that were separate. including a yard waste bin (table scraps, coffee grounds etc). I guess my little municipality here doesn’t have the budget to deal with yardwaste. Some of the newer parts of Venice are artificial islands based on rubbish – I don’t know if that’s where it all goes. Good idea if you love close enough and are in good enough shape to carry their trash there. It can’t be easy for some people, having to carry their various types of rubbish to a collection area. I had a good 5 minute walk/trudge to my bins of choice, in Florence. That is fascinating, and very clever! Our area is very conscious of recycling, and has been for many years. I keep a compost bin, but we are also provided with very large “green cans”, not just for our garden waste, but for kitchen scraps as well. In the city of San Francisco, residents and businesses are required to put kitchen scraps into green cans. Apparently, the compost from the city of SF is very good! It’s good to hear that your bustling city has got its act together, Susie. Clever and not as well as this, but the building we are in has a great recycling program. Our Council has a recycling program, but it isn’t very cost effective, due to the distance the stuff has to be hauled from Dismal Swamp to a handling centre. I was very startled, the first time I saw the process!